I shouldn't have been home today. I asked for next weekend off, so we could combine a Father's Day party with my mother's 91st birthday party. Driver wisdom says you get more miles, and therefore more money, if you don't go home. Now, I'm not sure exactly what driver's wisdom is being referenced, here. Everyone buys into the idea now; but who is the first person to think of it? I don't know. Perhaps he retired off the huge amount of money he made by never being home. Perhaps he's one of those people who retires and is shortly afterwards killed by his wife, who discovers she doesn't actually like the guy very much when he's around 24/7. In any case, I've spotted a trend. Schneider sends me home for the weekend, and doesn't come up with another load for me until very late on Monday or even Tuesday. No wonder I'm not making any money. The weird thing is that I talk to other drivers who claim to be making plenty of money. I can't drive more miles than I'm given; so why are they getting more miles than I? My dispatcher claims it's all handled by computer so the miles should be pretty randomly, and therefore evenly, parceled out. But they don't seem to be, not to me. The bottled water I was delivering to the Phoenix area wasn't scheduled for delivery until this morning. But, since I didn't get home until late Saturday, I didn't mind too much. Friends had asked me to fix their computers, and had offered to pay me to do so. So I did that yesterday, and made more in the one day than I do in some weeks, driving. And, finally, at 7:30, after repeated checking, I was informed the load was ready. And so, again, I spent six hours in which I was not free to do whatever I pleased, yet got no pay—whatsoever—for the privilege. Previous jobs I've had, in which I sometimes was "on call", would never have dared to suggest an employee do such a thing. Well, that's not completely true. I was once manager of Information Systems at Arlington Hospital, and, as a salaried employee (not hourly), I once in a while received late night phone calls for some emergency or other that I had to take care of then and there, and did not get extra money for that. But these calls were rare and, in any case, I was making better than $60,000 a year (in 1980s dollars) to handle these problems. As I've said, I can sometimes get to a customer site early and either relay or, if the load is a drop, be ready for another load. However, it was now too late for me to arrive more than four hours early (the minimum to be considered for a relay), and the customer didn't actually open until 7 am so there was no point in arriving one or two hours before then. So I stopped at the El Dorado Hot Springs in Tonopah for a soak. Then I got back to the truck and continued to drive past midnight, toward La La Land. I hate to screw up my internal clock this way. I happen to be a person who sleeps best at night, say 11:00 pm to 7:00 am. I can stay up to 2 if need be or if I am working on something I'm excited about. But push me past that, especially behind a wheel, and it's just asking for trouble. And yesterday, though I tried to nap, I was basically alert having to call in every hour to see if the load was ready. So, by the time I got to Chiriaco Summit, I was beat. I calculated and found I could get a couple of hours' rest there, and still arrive on time for my morning delivery. My alarm bleated at 3:30 am; I poured myself from my bunk into the drivers' seat and took off down the hill. That early in the morning, I was able to miss the worst of the L.A. traffic. I had to keep punching myself in the face to keep awake. I arrived in Commerce at 7 am, exactly in time for my delivery, dropped the trailer, closed my curtains, and went to sleep for my eight hour DOT break. Fortunately, that customer has room for a bobtail to park for a few hours. After my break, I found I had a new assignment: paper products from Procter and Gamble, going right back to Phoenix…and not to be delivered until Friday morning. Yet, what could I do? I didn't want to miss my mom's birthday. I stopped in Fontana for fuel, then napped for an hour. At 1 am, I awoke and started driving towards Arizona. I made it as far as Ehrenberg before shutting down for a DOT break. Up at 1 pm, another 2½ hours saw me to Phoenix. I thus "got off work" at 4 pm. Some people complain about not ever being home. I love my family and I do want to be home…but I'm also a truck driver and I need to be driving. This is going to be another week in which I'll be lucky if I make the rent. I made my morning delivery. And now, I was off for the weekend. The party is tomorrow. I told my dispatcher to send me out on Sunday. Unfortunately, the load I brought to Phoenix can't be delivered until Monday morning. I am hoping that next week will be a better paying one, but this is, again, a poor start. That's the thing with this job. It's like the lottery. Every week, millions of people buy tickets, hoping to win. Every week, most of them do not win. And every week, they go back, buy more tickets, and keep hoping. I've been hoping for over ten months, now, to have a good week and to be able to maybe catch up on some of my bills. But it just keeps getting worse, I just keep getting farther behind. I am starting to detect my sense of adventure waning. Of course, real adventure just begins when the fun stops. Real adventures aren't fun. A real adventure begins when the rope breaks, or the engine fails, or the storm starts, or the map is lost. An ad-venture is when one's venture, that is, what one was doing, goes awry (ad = away from). So I suppose, in that sense, that this adventure really began when the World Trade Center was attacked and I lost my business. But it is starting to be a little more tedious than adventures are supposed to be. Today we had the combined party for Mom and me. Michael had a cake made that was divided diagonally, half for Mom's birthday, half for Father's Day. There was a time that he would have had two cakes. But now, we couldn't afford them. 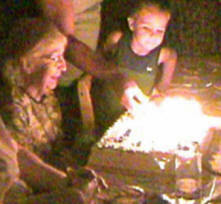 Still, Mom was able to blow out her candles (with her great-grandson Zachary's help), and that was something. (At 91, Mom's candles alone violate the strategic arms limitations of most smaller countries.) And our friends and Michael's sister and my former wife and kids were all there to help celebrate. Today, when I suggested that Monday's load be relayed, I was told there is no freight leaving Phoenix today. They can only relay a load if they have something else for me to do. If I was a stranger in town, I would get layover pay; but since I live here, Schneider is able to give me the day off, whether I want it off or not. And so they have. I try to focus on the joy of the moment and not the anxiety I feel building up, now that it's become clear that, for some reason I don't seem able to control, the job I've been at for ten and a half months, and still owe another month and a half to, is not paying the bills. I'm not sure what I am going to do, or what I can do. But I'm going to have to do something.